This may surprise you, but I am not a purse kind of girl. If I can't carry something in a pocket, I don't carry it. 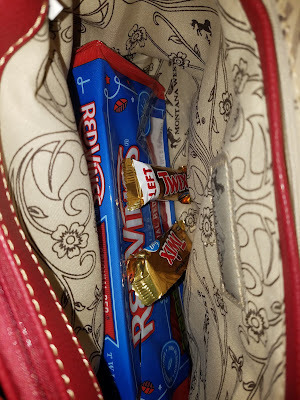 I do break my no-purse practice when going to the movies. How else am I going to smuggle all of my Dollar Store candy in during the summer? 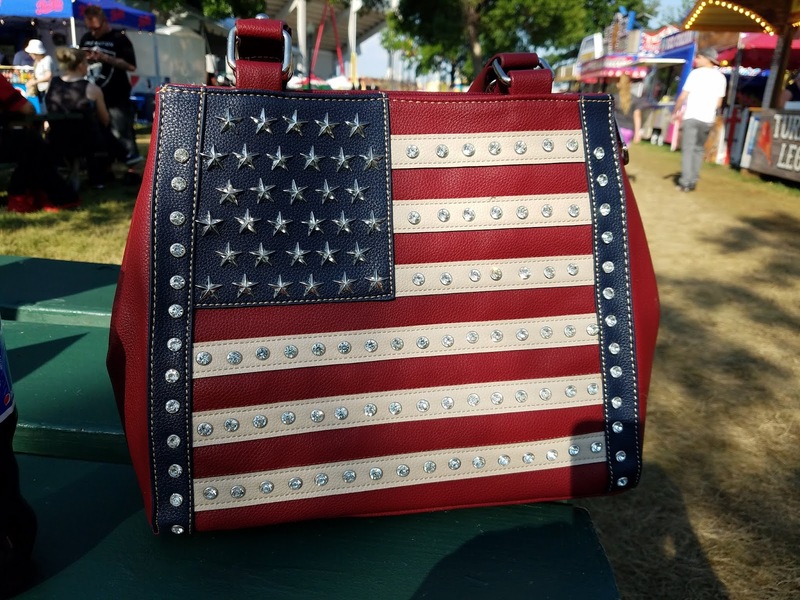 In the winter, it's easy, throw on the barn coat and load up the pockets, but in the summer ... well, it's just easier to carry a movie purse. The movie theater we most often frequent (Cinemark) has implemented a bag limit of 12"x12"x6" and all bags are subject to search "for safety reasons". Now, if I was worried about someone smuggling in a gun, I sure the hell would have made the bag size smaller. I can fit my Para, Jay's full-sized M&P, and my G42, plus magazines for each in my size-compliant movie purse. This is another of those "feel good" rules. Whatevs, I carry on my body, not in a purse, so they can search it and take my $6.00 worth of Dollar Store candy out of my purse. I bought a cheapo WalMart canvas purse at the beginning of the summer to use as my movie purse and it was adequate. I could fit two boxes of candy for each of us and a bottle of water if I forced it. Yes, those are rhinestones and silver studs. 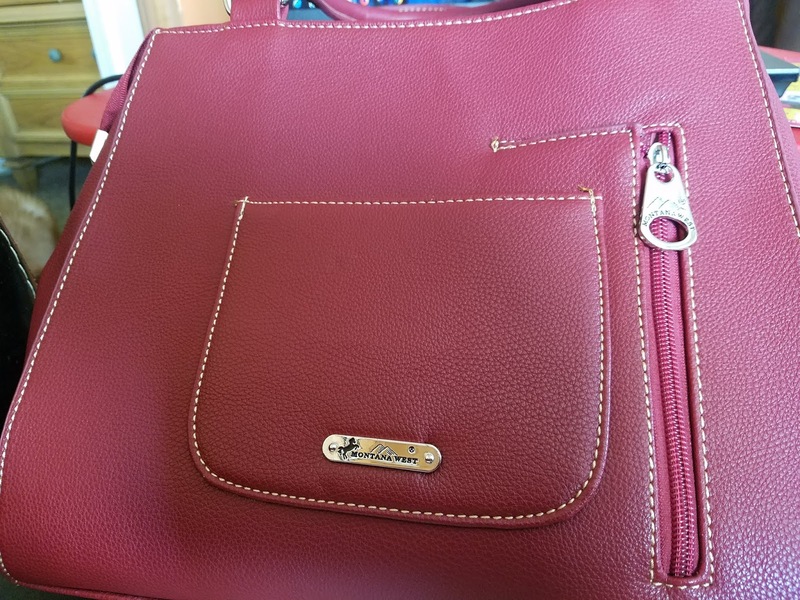 I didn't buy the purse that night (my shift was just starting), but I couldn't get it out of my head, so I dragged my husband back a few days later and bought it. I knew from the get-go that I wouldn't be using it for concealed carry, but I had to have it for my movie purse. And what an excellent movie purse it is. Not only do I have room for a ton of candy, but I have room for a lot of other important things. Things like a flashlight, knife, tourniquet, gloves, etc. The tourniquet and gloves slip down into the middle zippered pocket, which leaves ample room for other necessities. Lots of room left for the important stuff - candy! 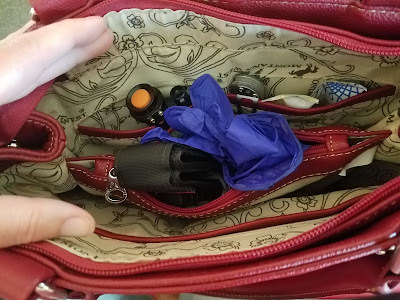 If my bag is searched, certainly the flashlight and knife will raise some eyebrows, but with the TQ tucked away, no one should give it any thought. However, if they unzip the middle pocket and see the TQ - and they know what the TQ is - they'll probably be suspicious that I'm carrying. I'm going to guess that the high school kids they have working at the movie theaters aren't going to know what it is, or aren't going to give a damn - they're just going through the motions. 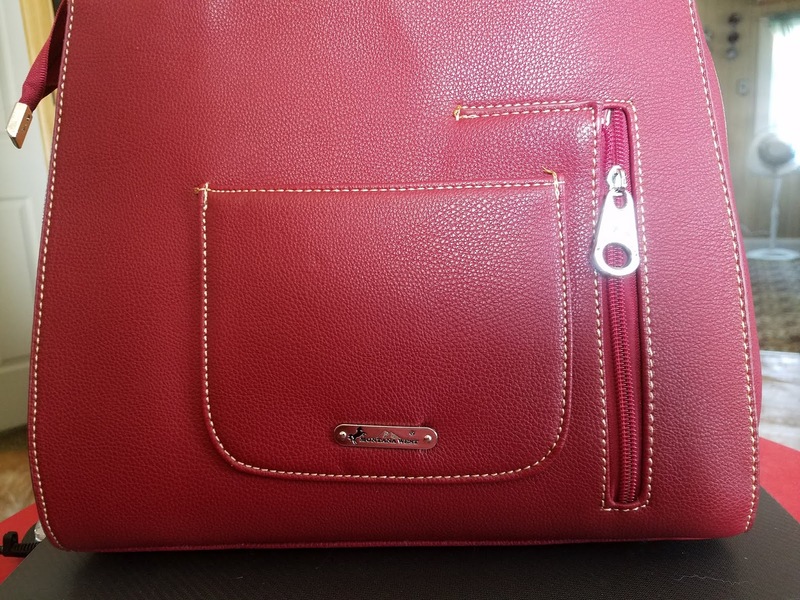 There is a zippered area on the back of the purse that's supposed to be where you conceal your gun. Um, it's not very discreet and it's not lockable. 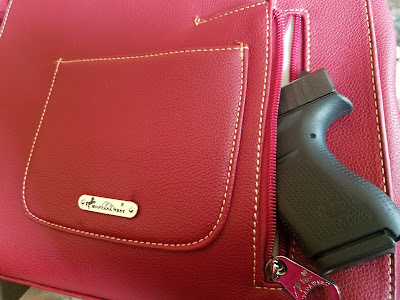 Since this purse was sold as a concealed carry purse, and even though I have no intentions of carrying in my purse, I thought I'd slip my gun in and see how well it would do. Wasn't sure there was room in the pocket for an actual holster, so went with trigger guard cover instead. No printing, so that's good. The inside of the concealment pocket is a basic lining material, so it's slippery. 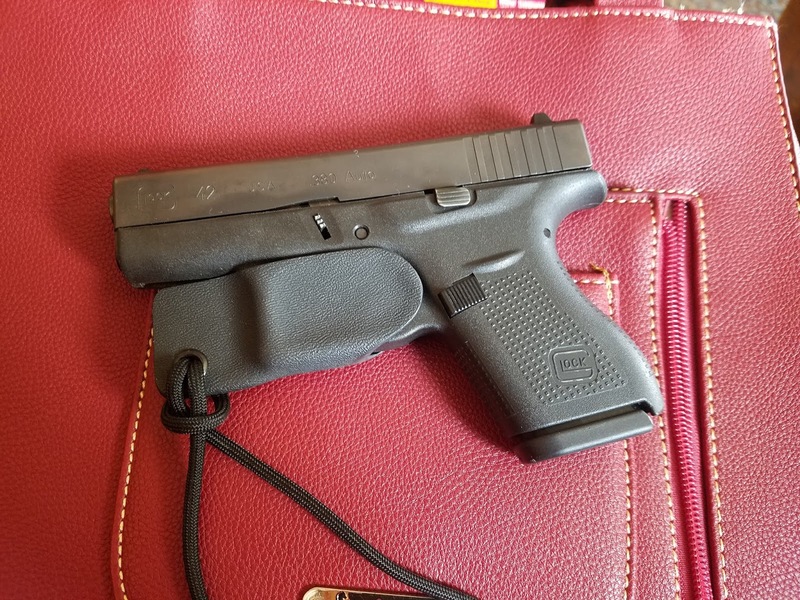 I wasn't sure that a holster would fit in there, so I used my trigger guard instead. 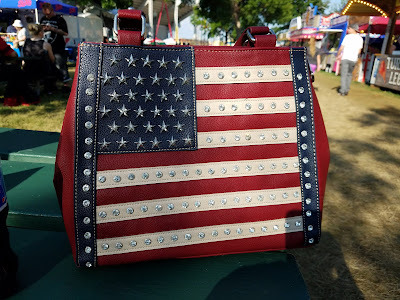 If I was going to use this purse for carrying, I would either secure a soft holster (like a Remora or Sticky holster) in the pocket with velcro, or I would sew the paracord from the trigger guard in place. There's no room in the zippered pocket to add an extra magazine without fouling up the arrangement. 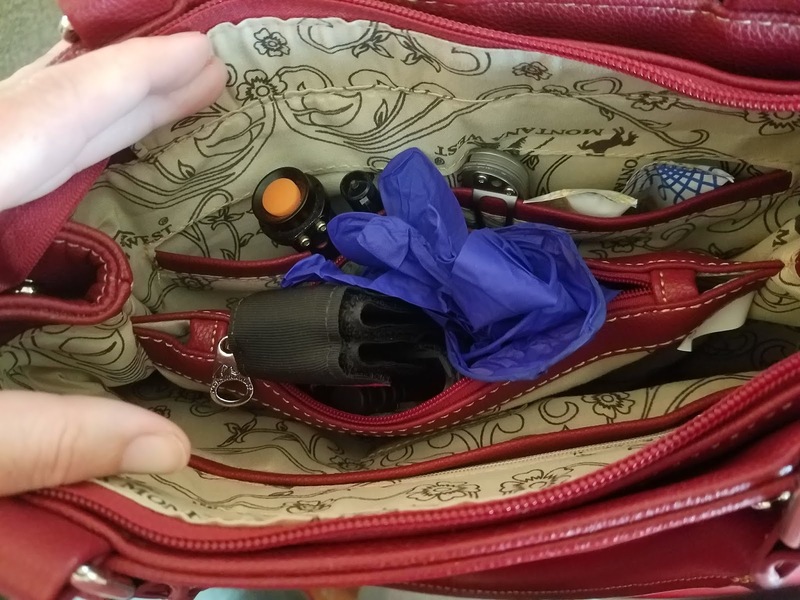 I suppose you could slip an extra mag into that small outer pocket, but that will print like hell, and if you put a mag inside the main part of the purse, it's not accessible.